Mountain Adventurers is an outdoor program designed for Grades 4 - 6 and 7/8 on PD half day Fridays from noon – 4 p.m. Students will go canoeing, mountain biking, rock climbing, cross country skiing and much more. 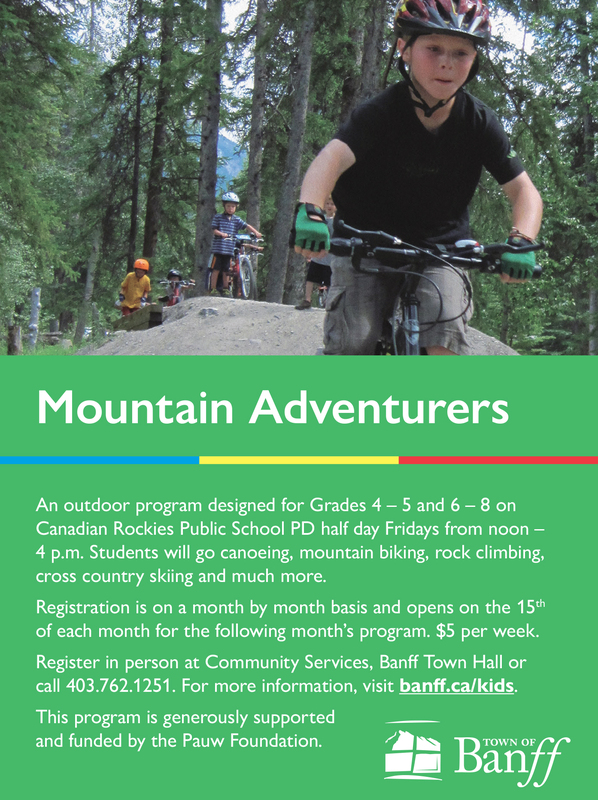 Mountain Adventurers runs on the following PD half day Fridays based on the 2018/19 Canadian Rockies Public School calendar from noon – 4 p.m. Registration for this program is on a month by month basis. Registration will open on the 15th of each month for the following month’s program (for example, to register your child for the December dates, you would call on November 15). Register in person at Community Services, Banff Town Hall or call 403.762.1251. This program is generously supported and funded by the Pauw Foundation.